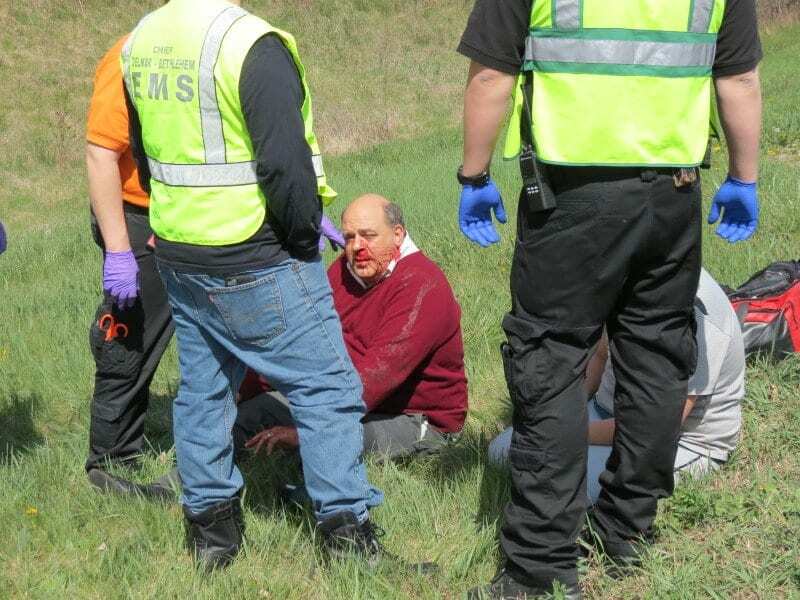 Timothy Berry, 48, of Albany, and his young son, were saved by passing travelers on Saturday, April 30, on the Delmar Bypass. 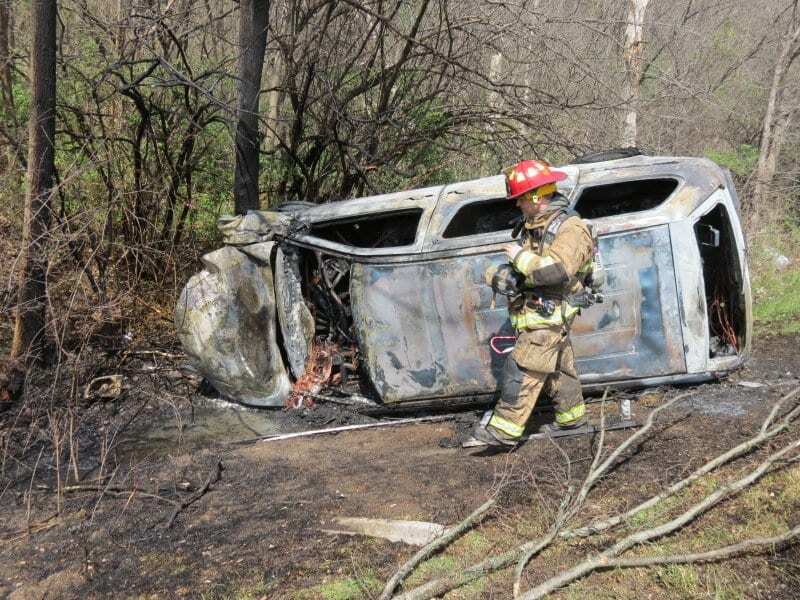 Spotlight photo by Tom Heffernan Sr.
On Saturday, April 30, at about 2:40 p.m., two Brooklyn men saved the life of two locals involved in a one-vehicle rollover crash on the Delmar Bypass in the area of Kenwood Avenue. 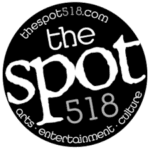 Investigations by police determined that Timothy Berry, 48, of Albany, was traveling southbound on the bypass with his child in the vehicle. Berry, a local lawyer, suffered a medical condition, which caused him to lose control of the vehicle, and drive off the roadway, said police. 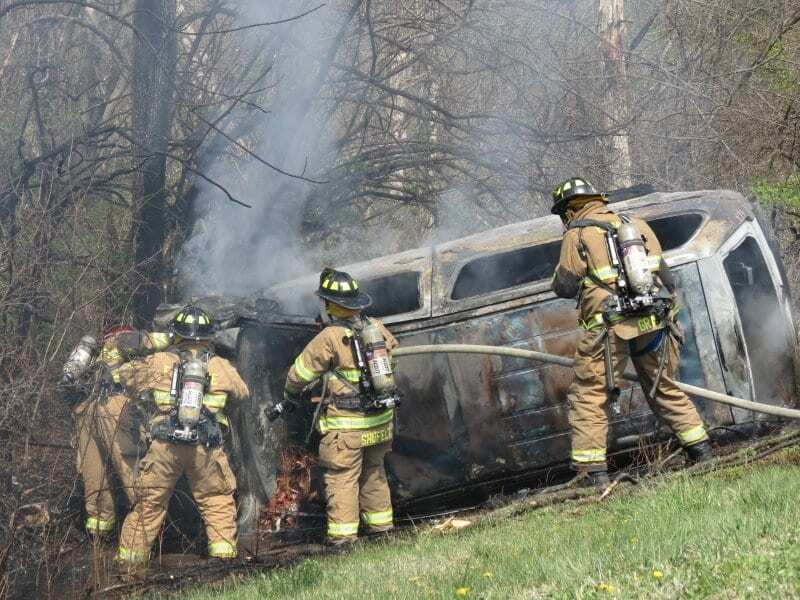 Passengers in a vehicle traveling behind Berry reportedly witnessed the crash and stopped to assist, as they saw the vehicle immediately catch fire. Dudwik Branach and Wieslaw Szcutowski, both of Brooklyn, rushed to the vehicle and were able to break out the windows and assist the two dazed occupants to safety, just as the fire was entering the interior of the vehicle, according to reports. Responding members of the Bethlehem Police department worked to suppress the fire to prevent further injury to the injured parties and good Samaritans. Branach suffered a minor injury from breaking the glass and was treated and released at the scene. Berry was transported to Albany Medical Center for evaluation. 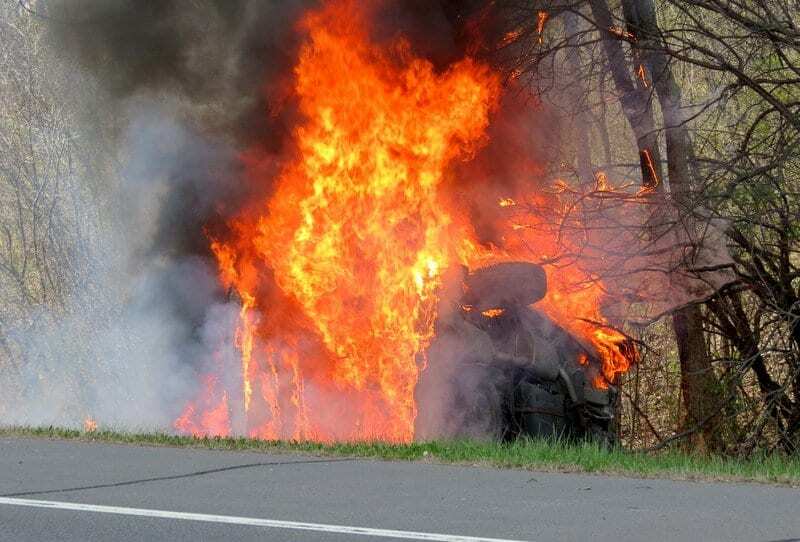 If not for the immediate actions of Brancach and Szcutowski, the vehicle’s occupants could have suffered serious injuries from the fire, said Bethlehem Police. The fire was subsequently suppressed by the Elsmere Fire Department, who responded with Delmar-Bethlehem EMS and Albany County Paramedics. Berry was transported to Albany Medical Center for evaluation. “The Bethlehem Police Department wishes to acknowledge the heroic efforts of Branach and Szcutowski, who disregarded their own personal safety to save the lives of two people in their time of need,” said Bethlehem Police Commander Adam Hornick. Firefighters respond to the scene. Photos provided by Tom Heffernan, Sr.
Berry and his son speak with responding officers. Berry’s vehicle after the crash.